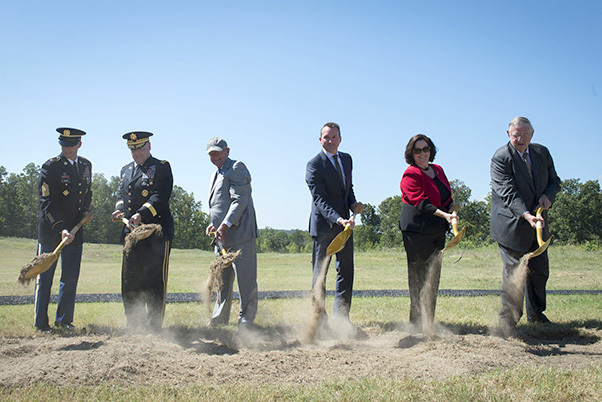 The groundbreaking ceremony for the National Army Museum at Fort Belvoir, Va., Sept. 14, 2016, was performed by (from left): Sgt. Maj. of the Army Daniel A. Dailey; Chief of Staff of the Army Gen. Mark A. Milley; Retired Army Chief of Staff Gen. Gordon R. Sullivan; Secretary of the Army Eric Fanning; Katherine Hammack, assistant secretary of the Army for Installations, Energy and Environment; and, retired Gen. William W. Hartzog, vice chairman of the Army Historical Foundation. “This museum will remind all of us what it means to be a Soldier, what it means to serve with incredible sacrifice, with incredible pride,” said Chief of Staff of the Army Gen. Mark A. Milley. “And most importantly, this museum is a tribute to those 30 million Soldiers who’ve worn this distinguished uniform … and their loved ones who supported them,” he said. 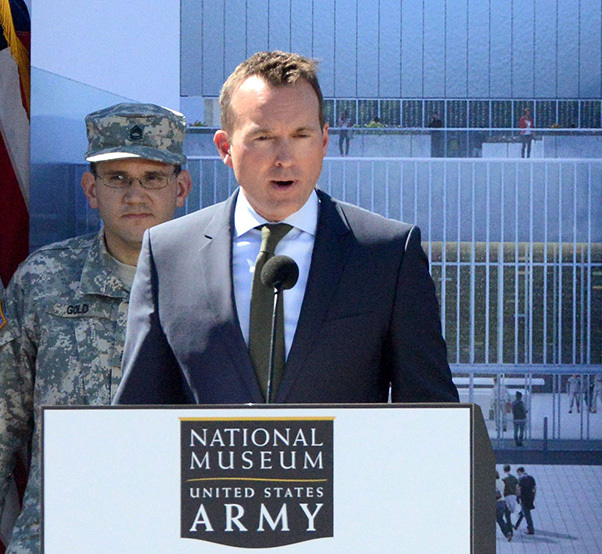 Milley, Secretary of the Army Eric Fanning, other Army leaders, donors, guests and Gold Star families attended the ceremony and groundbreaking of the National Army Museum, here at Fort Belvoir, Va., Sept. 14. The museum will be free-of-charge to visitors, and is expected to open in 2019. Plans for the 185,000-square-foot facility include more than 15,000 pieces of art, 30,000 artifacts, documents and images. In the museum, Army weapons, uniforms, equipment, and letters written by Soldiers at war will help visitors better connect with their Army, Milley said. 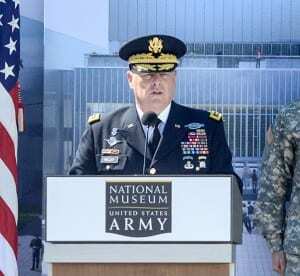 Chief of Staff of the Army Gen. Mark A. Milley speaks at the ceremony for the National Army Museum at Fort Belvoir, Va., Sept. 14, 2016. 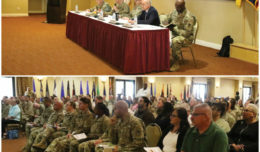 The Army, Fanning told the audience, is even older than the nation it defends, and its history and the nations have been intertwined since the beginning. From the Revolutionary War to the wars in Iraq and Afghanistan, the Army has borne the greatest share of America’s losses, Fanning said. Fully 85 percent of all Americans who have given their lives in defense of the U.S. and its interests have done so while serving in the Army. Besides fighting the nation’s wars, Soldiers have also been pioneers, Fanning said, citing the achievements of Capt. Meriwether Lewis and 2nd Lt. William Clark. Together, they led a team to explore and map the Western U.S., an effort that came to be known as the Lewis and Clark Expedition. Another example cited by Fanning was the effort by the Army Corps of Engineers to aid the construction of the nation’s roads, railroads, canals and bridges. 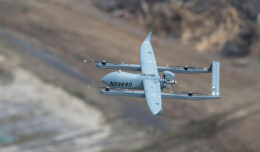 In the 20th century, he said, Army scientists guided America to new frontiers, pioneering advances in aviation, creating solar cells and launching America’s first satellite into space. Fanning said he is reminded of the Army’s pioneering history every day by a framed piece of regimental colors in his office. Those colors are what remains of the standard carried in the Civil War by the 54th Massachusetts, the Army’s first African-American regiment. That story, he said, will include all components of the Army, and will also include the story of the Continental Army, which existed even before the birth of the U.S.
Secretary of the Army Eric Fanning speaks at the ceremony for the National Army Museum at Fort Belvoir, Va., Sept. 14, 2016. Also significant, Sullivan said, is the museum’s location. The site chosen at Fort Belvoir is less than seven miles from Mount Vernon — the home of the Continental Army’s first commander-in-chief, Gen. George Washington. Retired Gen. William W. Hartzog, vice chairman of the Army Historical Foundation Board of Directors, said one of the first things visitors will see when they enter the museum is a series of pictures and histories of individual Soldiers. “We are all about Soldiers,” Hartzog said. During the groundbreaking ceremony, attendees heard some of those stories for themselves. Capt. Jason Stumpf of the 92nd Civil Affairs Battalion, 95th Civil Affairs Brigade at Fort Bragg, N.C., for instance, took the stage to talk about his wife, 1st Lt. Ashley White-Stumpf. “She was doing what she did for a greater good and she always believed this,” he said. She was killed in Afghanistan in 2011. White-Stumpf’s story will be one of many told at the new Army museum. Another will be that of now-deceased Staff Sgt. Donald “Dutch” Hoffman, uncle to Brig. Gen. Charles N. Pede, who now serves as the assistant judge advocate general for Military Law and Operations. Dutch enlisted at age 17, Pede said, and soon found himself in Korea. During his first firefight, Dutch had been scared. But shortly after, he attacked an enemy machine gun position by himself, rescuing wounded Soldiers and carrying them to safety. He earned a Silver Star for his actions. He would later be wounded in battle and left for dead, Pede continued. But a “miracle-working” Army doctor brought him back to life. Finally, now-retired Brig. Gen. Leo Brooks Jr. spoke about his late father, retired Maj. Gen. Leo A. Brooks Sr. When Brooks the senior entered the Army in 1954, his journey was filled with challenges, Brooks Jr. said, as the Army had only recently become desegregated. Brooks senior had to earn the respect of others as a leader, his son said. That he became a leader was due to the sacrifices of others before him. Brooks junior said he and his brother, Gen. Vincent K. Brooks, who now serves as commander of U.S. Forces Korea, U.N. Command and Combined Forces Command, both looked to their father for guidance — and followed him into the Army. 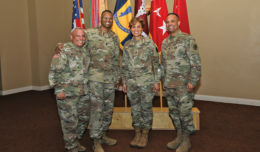 We “naturally followed in his profession because we could see and feel the nobility of the Army’s core values he instilled,” Brooks junior said. Today, the Army is the only military service without its own national museum. The National Museum of the United States Army, to be built on 80 acres of land at Fort Belvoir, will remedy that.